"From beginning to end your service has been great." "Your staff as been wonderful, considerate and patient with my farther. We are happy with your service." "Nurse was a great help keeping me informed of my options"
"Your therapist really took care of me and got me well again! Thanks"
Stellar Home Health Care, Inc is a Home Health Care Agency Licensed by the Illinois Department of Public Health. 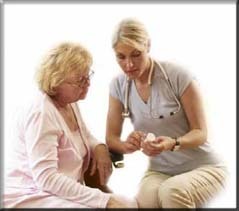 Choosing a health care provider is an important decision you have to make. You want to assure you or loved ones gets the best service available. At Stellar we offer you and your loved ones the best range of home care services to a relaxing recovery in the comfort of your home. We are committed to providing the highest quality of service, with our professional staff.